There’s a whole lotta fish procreation going on in the NE Pacific Ocean right now. This might be a surprise to those who think mating is more of a spring-fling-kinda-thing. It may be a further surprise that, for many marine fish species here, the males are the protectors of the next generation. The females leave after laying the eggs and the males remain, guarding the fertilized eggs from predators and often also fanning the eggs to ensure they are well aerated. For a lot of these fish species, the male chooses the nesting site and entices multiple females to lay eggs there so that he can fertilize them. He then has the work of guarding these multiple egg masses and may need to be on the alert for sneak fertilization attempts by other males. For species with nests of multiple egg masses, you can often tell how many females have laid eggs there because individual females have different coloured eggs. Therefore, the colour of fish eggs is not a good characteristic to determine the species that laid them. Instead, do a quick scan, chances are a piscine papa is somewhere near the eggs, staring at you. Through the photos below, meet some of these fabulous fish fathers. No deadbeat dads here! The encounter documented below shows how my dive buddy and I recently had a whitespotted greenling come after us, so intent was he on protecting his egg masses. I was very slow in cluing in that this was why he was swimming around us and deserved getting a little nip in the head. Notice how small he is relative to us and yet how this did not deter him in trying to get rid of us. Most often Kelp Greenling eggs are in the empty shells of giant barnacles as shown below. Although they are a bigger member of the Greenling family, male Kelp Greenlings do not appear to protect their eggs quite as vigorously as Whitespotted Greenlings. They appear to have a really long breeding season in our area. There are Buffalo Sculpin males guarding eggs at this time of year too but more mating appears to be happen in April and May. Usually, Buffalo Sculpins are even harder to spot than their Red Irish Lord cousins but the variably coloured, bright egg masses give away their location. They too have a strategy of staying right atop the eggs and remaining motionless when faced with annoying human divers. Soon we will be participating in the Vancouver Aquarium’s annual Lingcod Egg Mass Count. Armed with an underwater slate, we will join divers along the Coast in helping determine the health of lingcod populations by looking at the number and size of the egg masses and if they are being guarded by males. And oh what fastidious fathers lingcod males are! The dedication to protecting the egg masses does vary from male to male but, generally, they do not leave their watch until the eggs hatch which can be more than 24 days. They could be guarding masses from multiple females separated by more than 7 m, and if laid by a female 5 years old and older, the egg masses can be the size of a watermelon and weigh up to 14 kg! That’s a lot to protect! 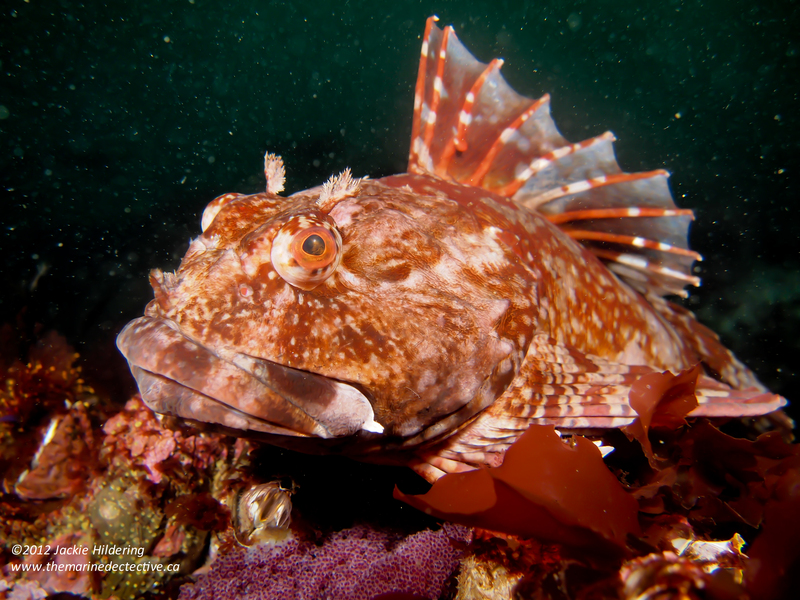 (As is also the case for many rockfish, the older the female lingcod, the more eggs she lays). My best lingcod story is that I was marking down “unguarded” on my slate only to have it knocked out of my hands by the male that was very much guarding the egg mass I had been observing! Lots more info on this species at my blog item Lingcod – Fastidious Fanged Fathers. My observations of egg guarding on NE Vancouver Island: January to April (Vancouver Aquarium’s Egg Mass Survey is from early February to the beginning of April). Here’s a case where it is not just the male that guards the eggs. Mr. and Mrs. Wolf Eel take turns wrapping their long tails around the large egg mass. I hope to one day have the opportunity to get a better image than this but, as a strategy for survival, the egg mass is often deep within the wolf eel couple’s den. Lots more information on this remarkable species at my previous blog item Wolf Eel – No Ugly Fish! Previous TMD blog item on the species: Wolf Eel – No Ugly Fish! I’ve only once been lucky enough to find a male of this huge sculpin species guarding eggs. They can apparently be very aggressive guarders but this very successful male (he was guarding the eggs of several females) was very tolerant of my presence. They have been documented to mate throughout the year. My one encounter with a male cabezon guarding eggs was in May. In all these years of diving, I have yet to find a male Painted Greening guarding eggs so that I know for sure the eggs are from this species. Yet something else to be on the lookout for! And, the stuff of dreams . . . to one day chance upon a male grunt sculpin while he is releasing the hatching eggs from . . . his mouth! For more on that, see my previous blog item Grunt Sculpin – Little Fish, BIG Attitude. The females apparently also do take on shifts in taking care of the eggs. You need not be a diver to see the eggs of the following two species. come across these egg masses and possibly even the male guarding them. I have never seen scalyhead sculpin eggs while diving, likely because they are hidden away and because they are much smaller. The image of the eggs below was taken during a beach walk where students ensured they put the rock back as best they could to reduce the chances of the eggs drying out. Notice the different colours of the looney-sized egg masses? The eggs in this nest are from at least 4 females. If you find an ice cream scoop mound like this, you have likely found the eggs of the black prickleback and the guarding male is likely very near. When taking students on beach walks, I emphasize the importance of not displacing animals by using this species as an example. Fish like the black prickleback are adapted to being able to wait out the tide in very little water and if the well-intentioned pick up the fish to put him in deeper water, they could be moving papa away from the eggs he was guarding. My 800th Dive. From Shiner to Shining?